This is part three of a four-part post series concerning empathy and the HONY blog. In the first and second posts, I have highlighted the effectiveness of the HONY blog in terms of evoking empathic responses from readers, as well as its ability to sidestep some of the problems inherent in photojournalism. For this and the remaining post, I would like to directly address the possible reasons why readers of the HONY blog continuously expose themselves to, and empathise with, heartbreaking stories, and manage to do so while nevertheless avoiding empathy fatigue. My intention is to uncover some of the dynamics that, on the face of it, may not logically seem to contribute to empathic responses, but might serve to nonetheless create this relationship via the HONY blog. It seems an unaccountable pleasure, which the spectators of a well-written tragedy receive from sorrow, terror, anxiety, and other passions, that are in themselves disagreeable and uneasy. The more they are touched and affected, the more are they delighted with the spectacle […] They are pleased in proportion as they are afflicted, and never are so happy as when they employ tears, sobs, and cries to give vent to their sorrow, and relieve their heart, swoln with the tenderest sympathy and compassion. Perhaps we approach tragedy in fiction because it allows us to explore deep feelings in a safe environment and from a safe distance. In her theory of Narrative Empathy, Suzanne Keen indicates that fiction offers us the luxury of experiencing the kind of emotions we actively seek to avoid in our daily lives without us worrying about real-life consequences and without the need for self-protection. In addition to Keen’s theory, my personal observation lead me to think that human beings are motivated to be “psychologically balanced” and seek to achieve this kind of balance by experiencing the entire spectrum of human emotions [a recent study indirectly supports this speculation]. Consequently, a monotonous emotional existence, even if it was constituted by happiness, could not sustain its appeal unless contrasting emotional experiences were present every now and then. Tragedy, as a form of fiction, offers us precisely this contrast. Even though the readers of the HONY blog are fully aware that the “hero” of every post is a real individual in real life, the motivation to experience sadness by reading and empathising with real stories that depict pain and sorrow is similar to that behind our attraction to tragedy in the arts. In other words, the kind of pleasure alluded to by Hume may still play a (rather unconscious) role. To understand why this might be, it’s useful to draw on a study conducted by Thalia R. Goldstein, in which participants reported their levels of sadness and anxiety in response to two fictional and two nonfictional film clips and in relation to recalling a personal sad experience. Goldstein found that personally experienced sad events elicited high levels of anxiety and sadness, but the sadness elicited by both fictional and nonfictional films was “unadulterated by the anxiety that accompanies the sadness of personal experience”, hence evoking a particular unsuspecting pleasure while vicariously experiencing sorrow. I suspect similar dynamics are at play on the HONY blog’s refugee series that may serve to explain why readers of the blog continuously expose themselves to, and empathise with, heartbreaking stories, and manage to do so while nevertheless avoiding empathy fatigue. First, even though continuous empathic response towards the sadness of another in suffering might lead to empathy fatigue, this does not appear to be the case in relation to reading nonfictional narratives like those on the HONY blog, as readers get to experience pure sadness towards others, without the uncomfortable effects of anxiety. Second, the idea that reading nonfictional tragic stories elicits such pure sadness, which we might be motivated to seek to experience on some psychological level in order to achieve emotional balance, may act as a vehicle that evokes empathic responses in the readers of the HONY blog. To elaborate, the HONY blog appears to constructively exploit a particular psychological need of its readers in such a way that the fulfilment of this need—by reading the HONY blog and empathising with the subjects of the posts day after day—acts as a glue or an incentive that promotes continuous attention to and increased awareness of the tragic state of affairs that fellow humans beings are subjected to. 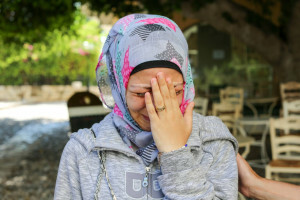 In this post, I have focused on the need to experience unadulterated sadness, as it is probable that it directly relates to the readers of the refugee series on the HONY blog. But the point I want to make is that, given what we know about the complex relationship between empathy and helping behaviour, for an online platform to influence the behaviour of its readers, it is perhaps beneficial to appeal to their psychological needs in order to instigate the motivation to perform a desired behaviour: in this case, to get up and do something to help one’s fellow human beings, or at the very least, develop greater awareness and tolerance. With reference to the points I discussed in the previous posts, the nature of the media and photojournalism more often than not inadvertently suppresses our capacity for empathy, and perhaps it is through attention to subtle dynamics such as the ones discussed here that the media is able not only to merely inform a large audience about issues that matter but also mitigate these effects and promote greater empathy and prosocial behaviour. For the next and final post, I intend to draw attention to elements inherent in the written text on the HONY blog that may potentially trigger empathic responses in readers.